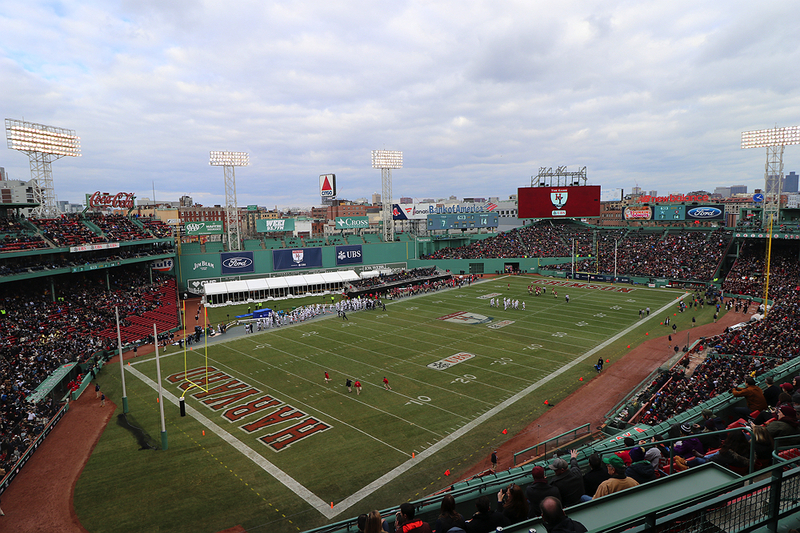 Green (and Crimson and Blue) Day: No stranger to football or big events, Fenway Park was decked out in its finest for its first Harvard-Yale game. 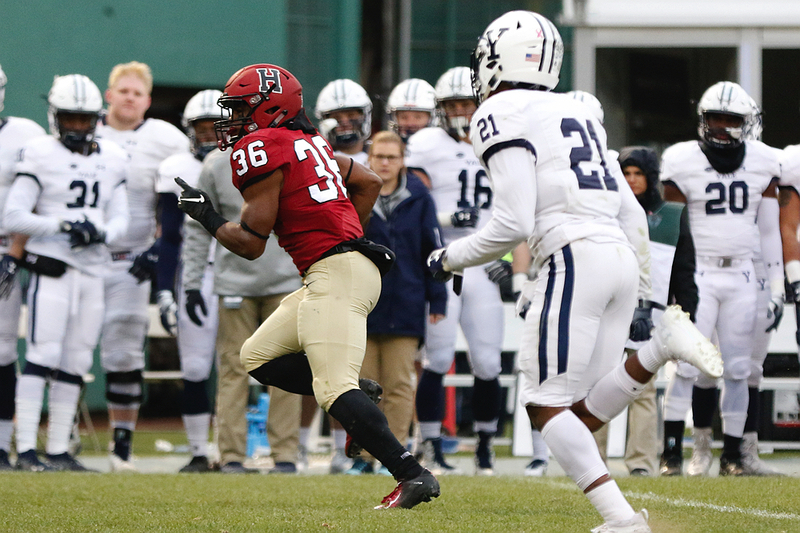 All the way: Having taken a handoff on an end-around play, Harvard’s Tyler Adams eluded Yale’s defensive back Miles Oldacre en route to a 62-yard touchdown. The second-quarter score gave the Crimson a 14-7 lead. Down goes Eli: After beating Yale blocker Sterling Strother, Harvard defensive lineman Scott Garrison tackles quarterback Griffin O’Connor. The third-quarter sack forced the Elis to settle for a field goal. Finger-wagging: The gesture by the Crimson’s Devin Darrington brought down a taunting penalty and cost Harvard a touchdown. The sophomore came back to score twice in the fourth quarter. Squeeze play: Devin Darrington wriggles his way to the goal line. The Harvard sophomore’s fourth-quarter, four-yard touchdown run gave the Crimson a 38-27 lead. 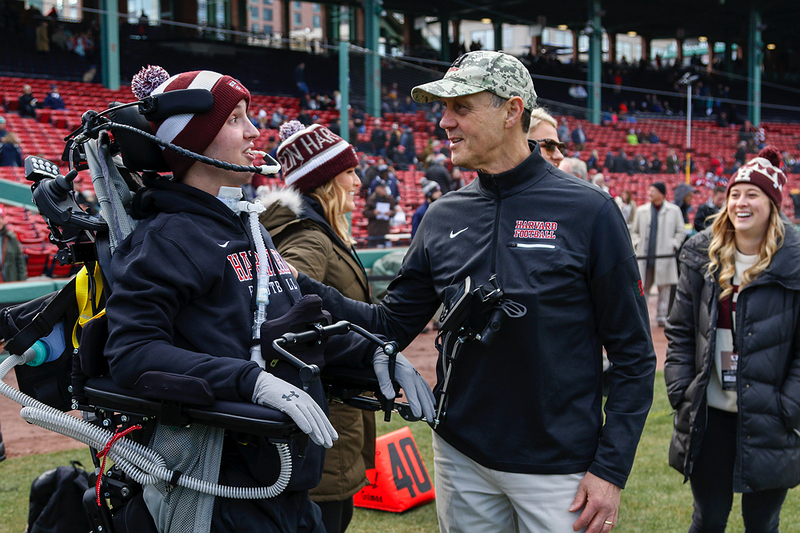 Quite a tonic: The smile of paralyzed Harvard defensive back Ben Abercrombie ’21 during the pregame warmups cheered Crimson coach Tim Murphy and his players. Vic Gatto ’69—captain of the Crimson team from the epic 1968 “Harvard Beats Yale, 29-29” game—has some pregame advice for 2018 captain Zach Miller ’19. Whatever Gatto said worked: Miller had two interceptions. The 135th playing of The Game on Saturday at Fenway Park had a flyover, fireworks, memories, controversy, second-guessing, at least one dignitary, a dastardly digit, trickeration, inspiration, heartbreak and (probably) the first mass chorus of “Sweet Caroline” at a Harvard-Yale game. It also had scoring, lots of scoring—the highest point total in a series that began in 1875. At the final whistle, the Crimson had outlasted the Elis and the officials, pulling away with 17 points in the final quarter to win 45-27. The victory was Harvard’s third straight to end the season and gave the Crimson a 6-4 overall record and a 4-3 mark in the Ivy League, good for a third-place finish. Yale dropped to 5-5, 3-4 and a tie for fourth (see Final Standings, below). The triumph broke a two-game losing streak for Harvard in The Game and gave Crimson coach Tim Murphy an 18-7 record against Yale. “I don’t know when I’ve been more proud of a football team,” said an exultant Murphy, who has won nine Ivy titles in Cambridge but had seen this season’s squad drop to 3-4 after a 24-17 loss at Dartmouth on October 27. “The effort, the attitude, and the resiliency have been there every single day. We got stronger as the season went on. This was a great November.” It was particularly great for senior quarterback Tom Stewart, who had one of the more meteoric careers—really, half a season—in Crimson history. On Saturday Stewart went out brilliantly, completing 18 of 27 passes for 312 yards and three touchdowns before being forced to retire, like a gladiator, on his shield. This Game marked the fiftieth anniversary of the epic “Harvard Beats Yale, 29-29” contest, and players from those teams were duly fêted. In the boxes along what is normally the first-base line, former Secretary of State John F. Kerry, Yale ’66, was holding court. There was also the inspirational pregame appearance on the Crimson sideline of Ben “Badger” Abercrombie ’21, the Harvard defensive back who remains paralyzed as a result of a collision sustained in the first game of the 2017 season against Rhode Island. Abercrombie is determined to return to school next fall. Just before kickoff, Fenway rocked and tottered as a squadron of military jets performed a flyover. When the game began, the aerial show continued in earnest. It was clear that the Elis had decided not to let the Crimson’s star runner, sophomore Aaron Shampklin, beat them. That part worked, as Shampklin was held to a subpar 53 yards on 13 carries. 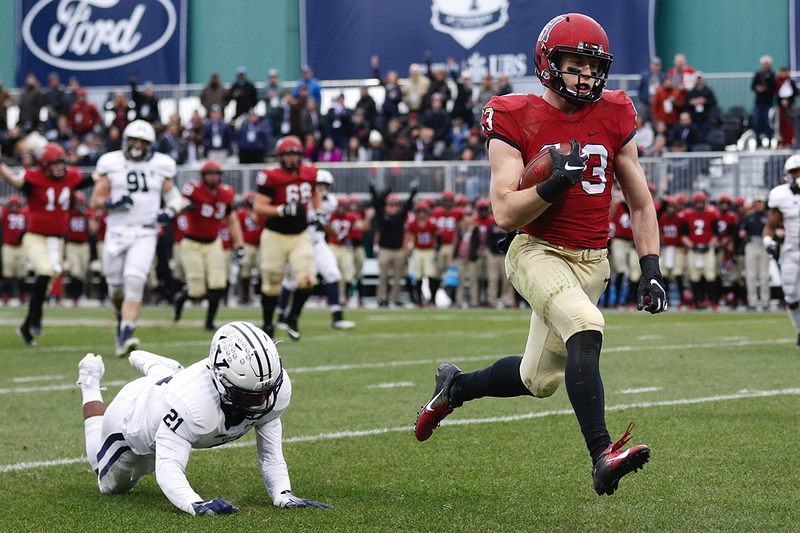 So midway through the first period, after Harvard senior defensive back and captain Zach Miller had intercepted a pass by Yale quarterback Griffin O’Connor, Stewart dropped his first bomb, a 38-yarder to junior wideout Jack Cook. Six plays later, Stewart threw a dart to senior wideout Henry Taylor in the back of the end zone for a 22-yard touchdown. Junior Jake McIntyre converted. (By the end of his day, his left leg would be very tired.) Harvard 7, Yale 0. The lead didn’t even last three-and-half minutes. O’Connor led the Elis on a 10-play, 76-yard drive that culminated in a five-yard touchdown run by Alan Lamar. Alex Galland booted the conversion. Harvard 7, Yale 7. It stayed that way until the middle of the second period. The Crimson offense came out in the Wildcat formation, with the snap going not to a quarterback but to sophomore running back B.J. Watson. Watson handed the ball to sophomore wideout Tyler Adams, who was steaming from left to right. The play was, essentially, an old-fashioned end-around. Adams sped to the right flank, turned upfield, and outran everyone to the end zone. McIntyre booted the extra point. Harvard 14, Yale 7. Back came the Elis. On the next Harvard drive Stewart was picked off by Yale defensive back Rodney Thomas II. Four plays later O’Connor and wideout JP Shohfi connected on a 16-yard touchdown toss. Galland kicked. Harvard 14, Yale 14. It was beginning to look like the NBA adage would apply: First team to 100 points wins. An exchange of punts ensued, giving Harvard the ball at its 23-yard-line with 1:22 left before halftime. First Stewart completed an eight-yard-pass to Shampklin. Then the quarterback unfurled another bomb, throwing on the run down the right side to senior wideout Brian Dunlap, good for 43 yards. Shampklin ran for seven. Finally, from the 19-yard line, Stewart flipped a little pitch to Taylor, who was running a short pattern from right to left. Taylor caught the ball at about the 12 and then got up enough steam to drag would-be Yale tackler Noah Pope to the end-zone pylon. McIntyre’s kick was straight and true. At the half, it was Harvard 21, Yale 14. But early in the third quarter came the first controversial call of the day. O’Connor briskly directed the Elis from their 25 to the Crimson eight. There, on third-and-goal, he threw a pass in the right flat to running back Zane Dudek. Harvard senior defensive back Wesley Ogsbury got to Dudek the same time as the ball did. His smash hit, which looked to be at Dudek’s shoulder level, caused an incompletion. But hold the phone! An official threw a flag and charged Ogsbury with targeting—taking deliberate aim at the receiver to inflict injury. 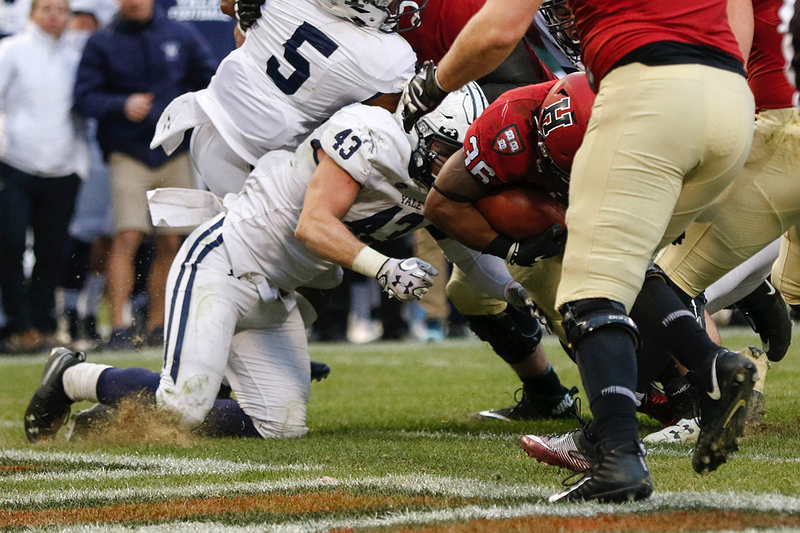 Instead of being faced with fourth-and-goal from the eight, Yale was awarded a first down at the four-yard-line; meantime, Ogsbury was ejected. The effect of the penalty was two-fold. 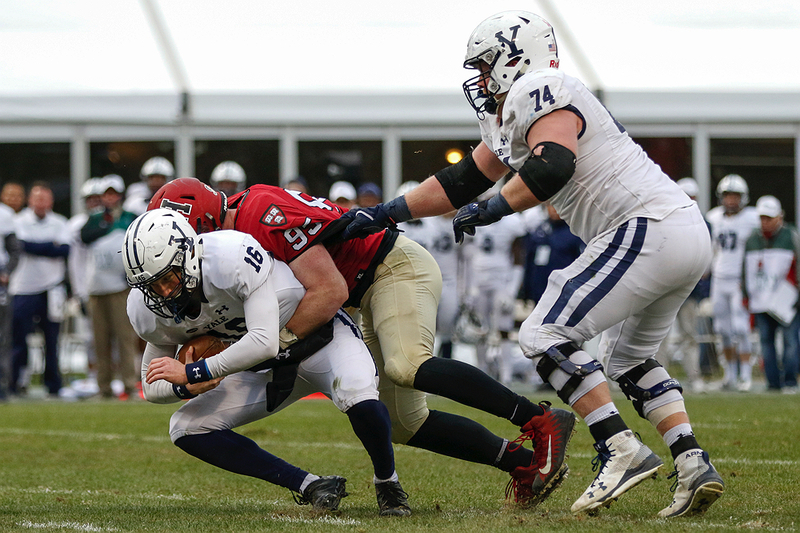 The immediate upshot was to give Yale a pathway to a touchdown instead of having to settle for a field goal; O’Connor would wedge the final yard for six points, and Galland added the point after touchdown. Harvard 21, Yale 21. 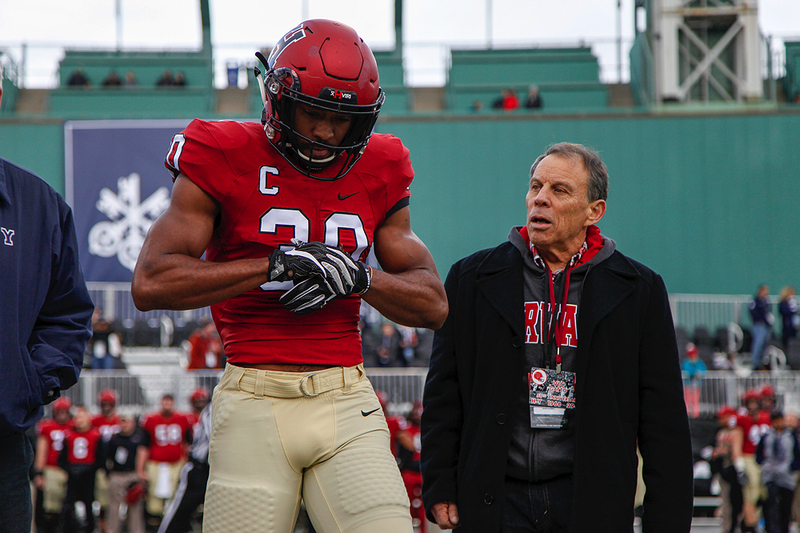 The longer-term impact was to deprive the Crimson of its best secondary ball hawk (six interceptions, tied for second-most in the Ivy League in 2018) and most aggressive coverage man. On its next possession Harvard went three-and-out. Taking over at its 27, Yale drove all the way to the Crimson six, courtesy of a 48-yard pass from O’Connor to Shohfi. (It’s possible that Ogsbury would have been the cover man had he remained in the game.) But here the Harvard defense showed its mettle. On first down, senior defensive tackle Scott Garrison broke through to sack O’Connor for an eight-yard loss. (Upon reflection, maybe the game’s biggest play.) Two incompletions followed. On fourth down, Galland’s 32-yard field-goal try sneaked inside the left upright. Yale 24, Harvard 21. In the immortal question of John Belushi, did we give up when the Germans bombed Pearl Harbor? Right back came Stewart on a 75-yard touchdown drive, completing four passes and even running for 12 yards. On the final toss, Stewart found Cook with a short flip and Cook legged it the remainder of the 15 yards to the goal line. McIntyre again swung his leg. Harvard 28, Yale 24. The result was that the Crimson had to resume its drive. There was an anxious moment when the officials had to examine a replay of a catch by junior tight end John Stivers to see if he had fumbled before he was ruled down, and a sigh of relief when Harvard was allowed to keep the ball. But even though McIntyre banged home a 36-yard field goal to make the score Harvard 31, Yale 27, there was much grumbling (even as the crowd sang the Red Sox anthem “Sweet Caroline,” with the beginning of the fourth quarter standing in for baseball’s seventh-inning stretch) over what seemingly should have been a safer lead. It turned out not to matter. On its ensuing possession Yale went three-and-out. A good return by Taylor coupled with an unsportsmanlike conduct call on Yale gave the Crimson the ball at the Eli 45. A 12-yard Adams run was followed by three rushes by Darrington—on the last of which he squeezed through a tight hole into the end zone. McIntyre kicked. Harvard 38, Yale 27. Now the Elis looked worn down. Again they went three and out. A punt again gave the Crimson excellent field position and Harvard began driving for the coup de grâce. The Crimson reached the Yale 17. On first and 10, Stewart took the snap and ran to his right. Seeing Eli tacklers, he went into the slide that quarterbacks are permitted as a protective measure. His right leg appeared to get stuck under him and, the play over, he lay on the ground in agony. The stretchers were summoned. The early reports were that Stewart had suffered a serious and disabling injury, but later ones were more optimistic. In trotted sophomore quarterback Jake Smith, whom Stewart had replaced as the starter in midseason. On his first snap, Smith merely handed to Darrington, who gamboled through a large hole into the end zone. (No finger-wagging this time, though Darrington did take a long look into the Yale section along the third-base line.) McIntyre kicked the final point of the 2018 season. Harvard 45, Yale 27. The Crimson’s 45 points tied the Harvard high for The Game. The 72 combined points were the most ever in a Harvard-Yale game. 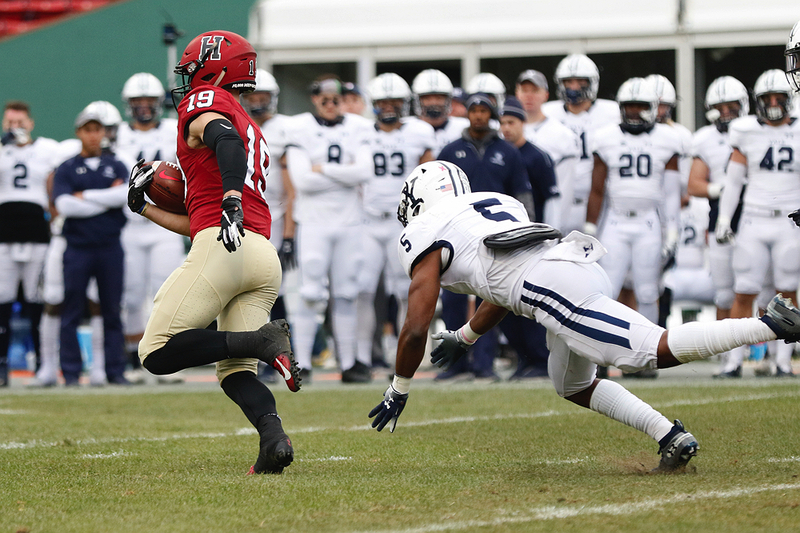 Harvard’s 605 total yards were the Crimson’s most ever against Yale—zooming way past the 518 amassed in 2012. Nor was Stewart around to see the final interception by captain Miller with 2:12 remaining. No matter. Tom Stewart had joined Tris Speaker, Teddy Ballgame, Carl Yastrzemski, and Mookie Betts in the 106-year pantheon of Fenway heroes. Tidbits: With Harvard’s victory, the series now stands at Yale 67 wins, Harvard 60 wins, and eight ties. Since formal Ivy League play began in 1956, Harvard’s record in The Game is 36-26-1….Since 2007, the Crimson is 31-8 in games played during November….Junior Jake McIntyre’s 36-yard, fourth-quarter field goal was his thirteenth of 2018 (on 15 attempts), tying the single-season mark held by Charles Brickley, A.B. 1915, in 1912, Matt Schindel ’08 in 2004, and Patrick Long ’10 in 2008….Hold on, tight! Last week in the NFL, four former Harvard tight ends caught passes: Kyle Juszczyk ’13, San Francisco 49ers (two receptions, 10 yards); Cam Brate ’14, Tampa Bay Buccaneers (one reception, 14 yards); Ben Braunecker ’16, Chicago Bears (one reception, 20 yards); and Anthony Firkser ’17, Tennessee Titans (one reception, 11 yards). Coming up: The 42-week off-season, during which we will binge-listen to a mix tape composed of such works as “Happy” by Pharrell Williams, “Overjoyed” by Stevie Wonder, “Happy Days Are Here Again” by Barbra Streisand, Handel’s “Hallelujah Chorus,” and Symphony No. 9 by Beethoven. The 146th season of Harvard football will kick off on Saturday, September 21, at San Diego. Happy holidays to all!